Once in a while I come across a great cookbook that I think is worth taking up space on my bookshelf and that I'm super excited to try lots of the recipes from. Honestly I love browsing and looking through recipe books but I don't very often like following recipes. Nine times out of 10 I think of something I would like to try or make then I search through 6 or 8 recipes that are similar to what I want to make and then I write down my own recipe that is similar to the ones I have researched but I've added my own tastes to it. There are very few recipe books that I have that I will just take the recipe and make it as is and I know that the recipes will be healthy and tasty just how I like them. One of those books I talk about HERE. And just recently I came across this book and knew it needed to have a place on my book shelf. 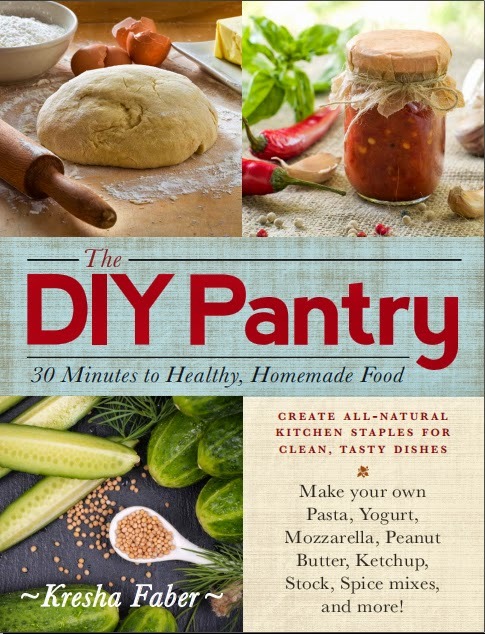 The DIY Pantry was written by Kresha Faber from Nourishing Joy. Although it's a recipe book it's unlike any recipe book I have ever seen. You won't find meals to make in this book, no.....it's full of pantry staple items. Kresha has taken things that most people would just buy from the store and stock their pantry with.....like seasoning mixes, boxed items, preserves and all sorts of other packaged goods and she has created homemade recipes that you can make to fill your pantry with. The thing I of course love most about it is that I am all about making as many things as possible from scratch that way you know what is in them. I was so excited to get my hands on this book and start trying out the recipes. The only thing I didn't like was that there wasn't pictures of the recipes....but then as I thought about it.....since they aren't meals they aren't really as exciting to have a picture of. So even though I love having pictures of what I'm making, it probably isn't as important for this type of recipe book. I have been following Kresha's blog for a while now and the recipes of hers that I have tried have always been excellent! I don't have to tweak them they always turn out good....tried and true. I like recipes like that!....It's exactly what I'm picky about with the recipes that I share. 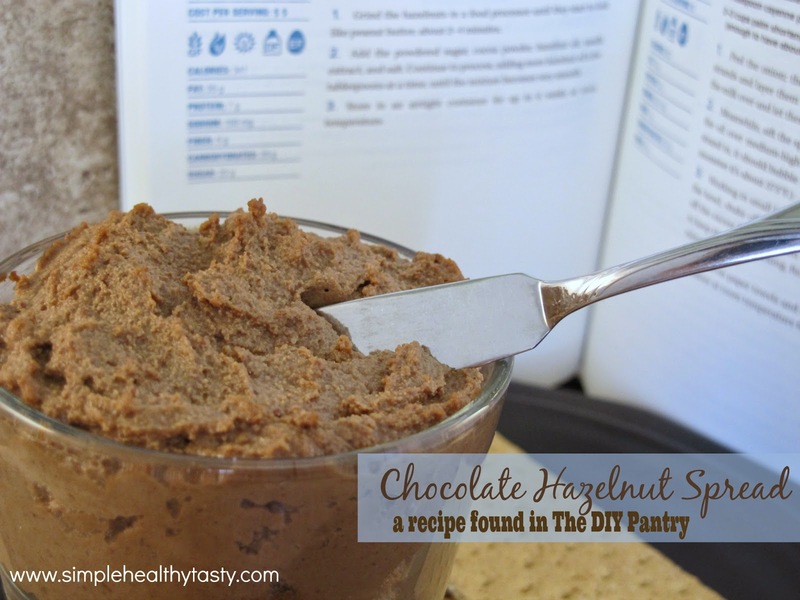 I made the Chocolate Hazelnut Spread the other day and it was a big hit at our house. My kids have never experienced Nutella, I didn't have blanched and peeled hazelnuts and wasn't about to peel each one so it was a bit grainy because of that but we didn't care. Next time I'll be sure to get hazelnuts without the skins on. Another thing that I really like is that all the recipes in her book take about 30 minutes or less to make. They are simple, comprehensive and tasty pantry items that aren't complicated and time consuming. I highly recommend this book for anyone who loves to have a healthy whole foods pantry and loves the simplicity of making things from scratch. The DIY Pantry features 165+ recipes for delicious homemade versions of your favorite store-bought foods. The recipes are crafted to mimic your favorite foods and each recipe can be made with less than 30 minutes of hands-on time. With The DIY Pantry, you can break free from processed foods and learn to make healthy, delicious meals without spending hours in the kitchen or breaking the bank. From artisan breads and aromatic seasonings to irresistible treats like Black-and-White Sandwich Cookies and Peppermint Patties, this book shows you how to stock your pantry with all the ingredients you need to make all your favorite meals. Buy now at your local bookstore or buy it at Amazon.